The Advisory Board Oncology Roundtable states that reduction in care variation is paramount to execute system imperatives.5 The system imperatives should focus on delivery of reliable care through standardized care delivery models, reduction in cost of care, and increased accessibility to care for all patients. According to the Oncology Roundtable, 95% of cancer programs have invested in the development of navigation programs since 2008, which equates to over 1.2 billion in direct cost for navigators. The results from the 2016 Oncology Roundtable Agenda Setting Topic Poll identified that 4 of the top 10 desired topics focused on navigation—navigation benchmarks; next-generation navigation models; impact of navigation on cost, quality, and outcomes; and patient navigation. This request for the above outlined topics reflects the need for additional professional administrative development to effectively build and lead integrated navigation processes within the cancer programs. How do I make sure navigators are adding value to the cancer program? How do I help navigators succeed in their role? How do I integrate navigators into the broader team? How do I make sure the patients who would benefit the most from navigation receive it? How do I measure the value of navigators? To increase the return on investment for navigation, the Advisory Board recommends programs perform data-driven analysis to demonstrate navigation value that impacts patient care delivery and outcomes. Once the metrics are gathered and trended, programs are directed to implement process improvement methodologies to improve and enhance navigation programs and ensure program goals are met. A mixed methods study by Blayney and colleagues in 2015 explored themes that translate to high-value practices that impact cost and quality of care. The 3 top-ranked themes are treatment planning and goal setting, navigation and palliative care in support of the patient journey, and care team functions at the highest level of competence and license.6 The study identified that the highly successful programs had the top themes integrated into their programs, which generate improved care delivery and a reduction in cost. The value of cancer care coordination has been challenging to demonstrate in a constant and heterogeneous manner so that measures translate across programs and benchmarks can be established. 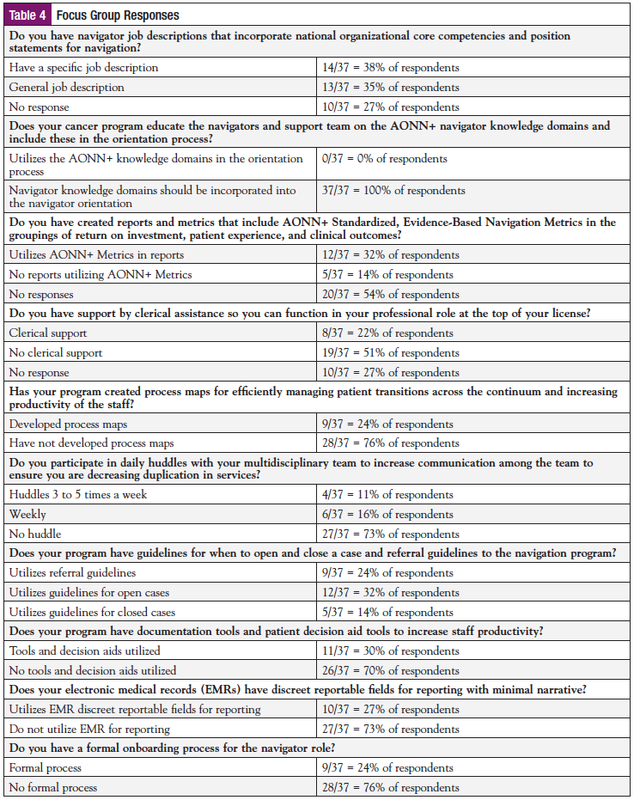 The Academy of Oncology Nurse & Patient Navigators (AONN+) published 35 standardized, evidence-based oncology navigation metrics in 2017.7 The next phase of this initiative will be to launch a multisite quality pilot study of 10 of the metrics to test the feasibility of data collection across settings and validate the reliability and validity of the measures. One of the defined outcomes for the study is to provide initial data to develop navigation benchmarks that programs, regardless of the model, can measure their performance against. The cancer program administrator is the individual responsible for planning, implementing, and evaluating the cancer program within the institution or physician practice to ensure national standards and guidelines are met and quality cancer care is delivered throughout the program. The cancer program administrator affirms values, sets goals, articulates a vision, and certifies that strategic imperatives are carried out according to the program’s mission. A clinical nurse navigator, also referred to as oncology nurse navigator, clinical nurse coordinator, or case manager, is a clinically trained individual responsible for identifying and addressing barriers to timely and appropriate cancer treatment throughout the cancer care continuum. More specifically, the nurse navigator acts as a central point of contact for a patient and coordinates all components involved in cancer care, including surgical, medical, and radiation oncologists; social workers; patient education; community support; financial and insurance assistance; etc. A patient navigator, also referred to as nonclinical licensed navigator, does not have clinical training but may work within the healthcare system, in community organizations, or as an independent contractor. A patient navigator may work within the healthcare system at the point of screening, diagnosis, treatment, or survivorship; outside the healthcare system at a community-based organization; or as a freelance patient navigator. The patient navigator, unlike a “lay” navigator, is a paid professional who serves as a broker between the patient and the healthcare system. Although navigation programs have been in existence for decades, national standards, core competencies, position statements, and knowledge domains from national organizations did not come into existence until 2008-2009. In 1990, case management, which is the precursor of oncology navigation, embedded goals into the model to increase coordination among the healthcare team while decreasing costs. Discussions between the case manager, physician, and multidisciplinary team included the patient and their family concerning the appropriate level of care following acute hospitalization. This was a pivotal point in time that allowed the patient to participate in the discharge disposition. Administrators at that time utilized the case management model for developing their navigation programs. Whereas the Oncology Nursing Society created navigation core competencies in 2013, the American College of Surgeons Commission on Cancer (CoC) was incorporating the navigation process, psychosocial distress, and survivorship care plan into the 2015 standards. As navigation programs across the country were established because of the new CoC standards, many questions still remained in regard to job descriptions and roles/responsibilities of the navigators and support staff; how the patients would be referred to the program; when were the key points of contact; and how were the navigators going to manage the critical transitions between the inpatient and outpatient setting, surgery, medical oncology, radiation oncology, and survivorship. Navigators hired during this period were often told, “You are our navigator, go navigate the patients.” This lack of guidance is still evident in many cancer centers today; cancer centers are in the process of reorganizing their programs because silos exist, and the patients are not truly followed across the continuum of care. Navigators are not proactively assessing the needs of the patients and their family and providing interventions that will remove barriers to their care. Navigation reports and metrics to measure success have been an afterthought, resulting in administrators asking about return on investment for their navigation programs. Navigators, regardless of the model, understand the needs of their patients and families and will provide the appropriate services to the best of their ability. However, as has been discussed at a national level, do administrators really understand the needs of a navigator? Are administrators fully aware of the infrastructure and support that are needed for their navigation programs? A focus group was held at the 8th Annual AONN+ National Preconference Evidence-Based Practice Metrics Committee Workshop to address the barriers and challenges navigators currently face with administrator engagement. In attendance were 37 clinical nurse and patient navigators, administrators, and representatives from pharma from across the country—from academic and community-based cancer programs, physician-based practices, advocacy groups, and industry (Table 1; Figure). 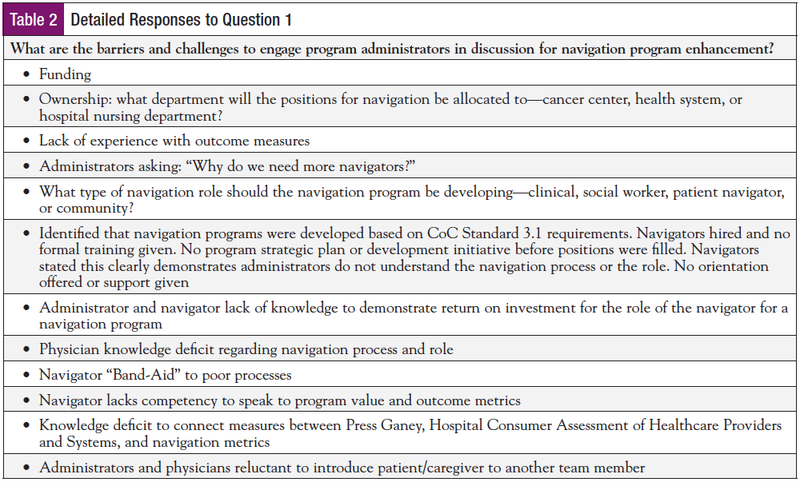 The first question, presented to navigators who are currently part of a developed navigation program, was, “What are the barriers and challenges to engage program administrators in discussion for navigation program enhancement?” The stage of program development varied among the participants, but each navigator was actively managing patients across the cancer continuum. The themes identified are budgetary constraints; little to no measurement for navigation processes; and knowledge deficit about the role and process of navigation by administrators, physician teams, and executive leadership. Refer to Table 2 for responses to question 1. Navigation programs are developed based on a requirement for care coordination defined either by CoC Standard 3.1 Patient Navigation or by value-based care models such as the Oncology Care Model. Administrators are hiring navigators to satisfy this requirement and ask the navigator to “go forth and navigate” with no formal navigation strategic plan or orientation process. This sets programs up to fail from the beginning. Navigators hired into these roles become easily frustrated because there is no program buy-in from administrators, physicians, and executive leaders for navigation processes, no metrics to measure success or opportunities for improvement, and no formal navigation orientation processes. It is very typical that navigators are bridges to poor processes. Navigators are seen as the answer to “fix” a process that is not functional instead of identifying why the process is not purposeful and a formal performance improvement process implemented to ensure efficiencies. This creates scope creep, multidisciplinary team frustration, and increased burden on the navigator. In the focus group, the theme rang clear and loud that navigators want to collaborate with their leadership to create program synergies and navigation successes that drive patient outcomes and improve quality-of-care delivery. Navigators desire administrative engagement to create program enhancements and successes. The second question asked, “What are the concerns that are expressed from your administrator that prevents program growth and development?” The top responses are lack of reimbursement for navigation services, knowledge deficit regarding navigation process and navigation roles and responsibilities, and hesitancy to identify a physician champion for the navigation program for fear that physician bias would be present. Also, fear that navigators would drive referral patterns that would create resistance from physicians regarding utilization of navigation services. The third qualitative question asked of the focus group was, “What are the essential components to ensure administrator engagement?” The key elements defined were education based on national standards and competencies, navigation outcome measures, dedicated resources and support for navigation programs, and administrator observation of navigation processes. See Table 3 for detailed responses. The navigators shared the value of administrative engagement to ensure program support and growth and implementation of performance improvement methodologies to enhance navigation processes and multidisciplinary synergies. The last open-ended question to the focus group participants was, “What would you like to add that addresses the support you require by your administrator?” The responses were the following: funding to support navigators attending annual navigation conference, funding to support certification, standardized education defined by scope of role and licensure, navigation program outcome metrics, strategic plan developed for navigation program, understanding of challenges with metrics collection and reporting, and formal on-board training. It is clear that the navigators strongly desire collaborative engagement and communication with their administrative leaders. The focus group was asked several questions to assess the current state of administrative engagement in their individual navigation programs (Table 4). The focus group identified that many of their current programs have been established based on national standards and requirements. The navigator positions were put in place, but the navigation processes and training have not been thoroughly developed. The navigators state that administrators have a knowledge deficit related to understanding the roles and responsibilities of a navigator across the cancer care continuum. Thirty-eight percent of the focus group reported they have a specific job description that incorporates national core competencies. Another 35% reported that they only have a general job description. Only 24% reported having a formal on-boarding orientation process, with 76% reporting no process in place. Program administrators are obligated to ensure an appropriate navigation orientation program is in place to facilitate a robust navigator on-boarding. Additionally, multidisciplinary education and collaboration are required to build successful sustainable navigation processes. The study found that 24% utilize process mapping in the navigation program development, whereas 76% have not applied process mapping. Huddles deployed 3 to 5 times a week as a strategy to improve team communication were reported by 11% and weekly by 16%, but 73% have not utilized team huddles. Application of guidelines for referrals was reported by 24%, utilization of guidelines for open active cases by 32%, and guidelines to report closed cases by 14%. Only 30% of the focus group reported using decision aids and tools. The implementation tools, such as process mapping, team huddles, referral guidelines, and decision aids, will strengthen and enhance navigation programs and facilitate strategic imperatives and team collaboration. The focus group outcomes demonstrated that the above areas of opportunities warrant further development and improvement. Programs are deficient collecting outcome metrics for navigation processes to measure return on investment, clinical outcomes, and patient satisfaction. Only 32% of the group reported collecting metrics to measure navigation. A question was asked about the utilization of the electronic medical record to facilitate data collection; only 27% responded that this tactic is utilized. Navigators in the focus group voiced their struggle to articulate the role and value of navigation, and how navigation directly impacts patient outcomes and quality of patient care delivery. Navigators and administrators will require additional competency development in the areas of research, performance improvement, operational management, and health economics. Navigators expressed frustration with administrators and executive leadership identifying the role of navigation as a fix of poor processes. The solution is not adding another task or responsibility to the navigator, believing this will resolve the current barriers and gaps. Navigators require clear role delineation and scope to guide processes and ensure appropriate function within licensure. The clinical and patient navigators representing a variety of settings clearly vocalized the importance of administrator engagement and building synergies with the cancer program leadership to enhance program outcomes and improve quality of patient care delivery. Administrator support is vital for a strong navigation program, starting with an orientation process that includes detailed navigation job descriptions, review of national standards, and a community needs assessment. In addition, the process should encompass AONN+ knowledge domains, internal and external resources for the program, health literacy, cultural competency, National Comprehensive Cancer Network and other national guidelines, navigation and support staff policies, and procedures such as a referral process on how to manage transitions, reports, and metrics, as well as any institution-specific mandatory education. Annual navigation competencies are very important for updating the team on any changes to these procedures. 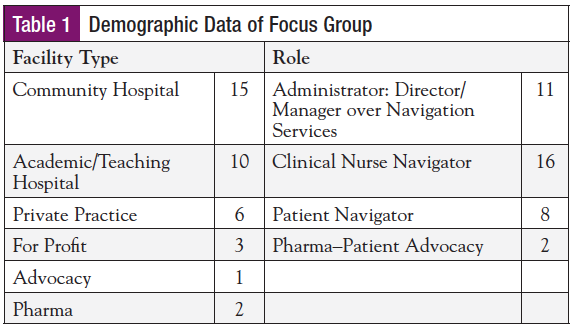 The navigation job description needs to include navigation core competencies, AONN+ knowledge domains, responsibilities related to the CoC standards and the findings from the Institute of Medicine report, and specific navigator responsibilities such as their role in the tumor conference or multidisciplinary centers. The internal resources that need to be reviewed during orientation are the multidisciplinary team roles and responsibilities as well as specific screening tools or programs. The internal resources would include but not be limited to social work, registered dietitian, genetic counseling, rehabilitation, palliative care, pastoral care, clinical trial staff, psychologist, oncology discharge planners, and financial counselors. The external resources, such as the American Cancer Society, the Cancer Support Community, the Breast Cancer Coalition, the Leukemia & Lymphoma Society, national reputable websites, and local community agencies and their resources are also key ingredients for a successful orientation process. The administrator also needs to instill in the team the need to communicate through morning meetings and/or huddles. They should be sharing information such as patients who have been admitted or discharged from the hospital, which patients will need follow-up with specific services/interventions, new resources, and changes in processes or policies. Process mapping exercises including the multidisciplinary team is a very effective way to identify opportunities for improvement of the program. The team should also invite their internal and external resources to these meetings to enhance the services and processes provided for the patients and their families. Reports and metrics need to be managed very diligently by the administrator, reviewing trends and outcomes, and implementing changes or interventions when appropriate. The administrator also needs to share these reports with the staff (including incorporation into their evaluations and quarterly reviews), cancer committee, and cancer center administration including medical director, providers, and other departments as necessary (ie, inpatient oncology unit, performance improvement department). As concerns arise for the navigation program, the administrator needs to listen to the staff, take ownership and research the concern, rectify the concern, and follow up with the staff. Teaming is a concept from the article “Teamwork on the Fly” from Harvard Business Review. “Teaming,” Amy C. Edmondson’s concept, helps individuals acquire knowledge, skills, and networks. And it lets companies accelerate the delivery of current products and services while responding quickly to new opportunities. Teaming is a way to get work done while figuring out how to do it better; it’s executing and learning at the same time.8 Teaming also builds trust among the team members, which is vital for a navigation program; they must have the support for each and every member on a daily basis. Bottom line, in the ever-changing and challenging world of navigation, the administrators must provide a detailed onboarding/orientation process and annual competency review. They must also keep the staff up to date with any new national guidelines or changes in guidelines, processes, or programs and be available to support and educate their staff on a daily basis. Our navigators need to be set up to succeed by being provided solid support from the navigator program administrator. Please visit the AONN+ website to access navigation program resources and tools: www.aonnonline.org/navigation-tools. 1. American Society of Clinical Oncology: The state of cancer care in America, 2014: a report by the American Society of Clinical Oncoogy. 2. Berwick DM, Nolan TW, Whittington J. The triple aim: care, health, and cost. Health Aff (Millwood). 2008;27:759-769. 3. Rocque GB, Partridge EE, Pisu M, et al. The patient care connect: transforming health care through lay navigation. J Oncol Pract. 2016;12:e633-e642. 4. Pratt-Chapman M, Willis A. Community cancer center administration and support for navigation services. Semin Oncol Nurs. 2013;29:141-148. 5. Advisory Board Oncology Roundtable. The Cancer Care Transformation Playbook: Opportunities to Reduce Unwarranted Care Variation in Oncology. 2017. 6. Blayney DW, Simon MK, Podtschaske B, et al. Critical lessons from high-value oncology practices. JAMA Oncol. 2018;4:164-171. 7. Academy of Oncology Nurse & Patient Navigators. Standardized Metrics Source Document. https://aonnonline.org/images/articles/standardized_metrics/Metrics-Source-Document.pdf. 2017. 8. Edmondson AC. How to master the new art of teaming: teamwork on the fly. Harvard Business Review. 2012:72-80.